PSALM students acted as hosts and guides as their “Road to Ottawa” opened with a reception for the public on February 2nd at the Monongalia Arts Center in Morgantown, West Virginia. West Virginia television and print media attended as students welcomed over 150 guests. The exhibit will be on display until February 24th. PSALM students, inspired by the people that “made it happen” and the continuing work to “finish the job” of a landmine-free world chose countries that signed the Mine Ban Treaty in 1997 painted artworks to celebrate this amazing achievement in disarmament history. PSALM’s art installation was designed to remind viewers of the importance of civil society in ensuring a more just and peaceful world for all. Chair sculptures both small and large are a nod to HI’s “Broken Chair” in Geneva. The sculptures are dedicated to the many campaigners, survivors and advocates who worked tirelessly to travel the “Road to Ottawa” and see through a new humanitarian treaty that, to this day, continues to save countless lives. Our work is not over until all are safe…a MINE FREE WORD IS POSSIBLE. Mr. Steve Costner from the U.S. State Department of weapons Abatement and Removal attended the exhibit to distribute “To Walk the Earth in Safety” Report on U.S. funding of landmine removal. The Office of Weapons Removal and Abatement in the U.S. State Department’s Bureau of Political-Military Affairs (PM/WRA) works with foreign governments and nongovernmental organizations to deliver programs and services aimed at reducing the harmful effects of at-risk, illicitly proliferated, and indiscriminately used conventional weapons of war worldwide. Ms. Elise Becker from Marshall Legacy Institute also attended to help PSALM educate others about MLI. Marshall legacy Institute the donates highly trained landmine detection dogs to mine-affected countries and trains local handlers to safely use these dogs to find landmines. PSALM students hosted a bake sale to raise funds for MLI in hopes of saving lives. Join PSALM ( Proud Students Against Land Mines) as they present their art installation, “THE ROAD TO OTTAWA: THE 20TH ANNIVERSARY OF THE MINE BAN TREATY” at the Monongalia Arts Center, Morgantown, West Virginia, USA, February 2nd-February 29th, 2018. Opening Reception will be held February 2nd, 5:30-7:30 pm. PSALM artworks are inspired by the countries that “made it happen” and the continuing work to ”finish the job” of a landmine-free world. Students will act as hosts and guides for the visitors at the opening reception on February 2nd, 2018. The Sixteenth Meeting of States Parties (16MSP) to the Mine Ban Treaty took place from 18 to 21 December 2017 at the UN Office at Vienna, Austria. 2017 marks 20 years since the Mine Ban Treaty was adopted, when the international community agreed to end the scourge of landmines once and for all. Following the adoption, on 3 December 1997 the treaty was signed by 122 States; it entered into force on 1 March 1999. To date, 162 nations have formally joined the treaty. The 16MSP provided a good opportunity for the international community to take stock of what have been achieved so far and to reaffirm commitments for a mine-free world by 2025. His Excellency Thomas Hajnoczi, Ambassador of Austria to the United Nations in Geneva wasthe President of the 16MSP. Ambassador Hajnoczi focused on Universalization, Victim Assistance and Mine Clearance of the Mine Ban Treaty. Click here to read Ambassador Hajnoczi’s priorities for the 16MSP. 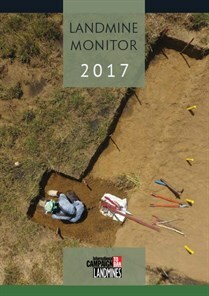 The 2017 Landmine Monitor report was launched on 14 December 2017. The 2017 report includes updates on the status of compliance to the Mine Ban Treaty, casualties related to landmines and explosive remnants of war, clearance of contaminated land, assistance to mine victims and financial support to mine action. The launch took place just prior to the Sixteenth Meeting of States Parties to the Mine Ban Treaty which was held in Vienna, Austria, from 18 to 21 December 2017. A briefing on key findings of the report was held for delegates present at the Sixteenth Meeting of States Parties in Vienna. Journalists interested in receiving advanced copies of the report or in joining the virtual launch of the report can get in touch via email: media@icblcmc.org or telephone: +41 22 920 0320. 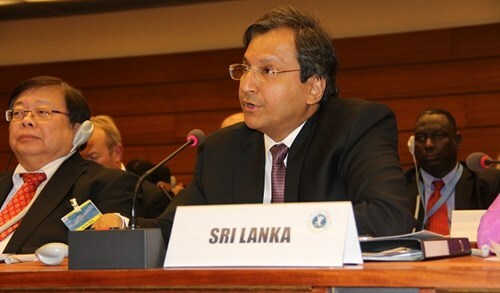 Sri Lanka has become the 163rd State Party to the 1997 Mine Ban Treaty, having deposited its instrument of accession at the United Nations’ headquarters on 13 December 2017. The International Campaign to Ban Landmines congratulates Sri Lanka for joining the international community to achieve a mine-free world. Sri Lanka is heavily affected by landmines and explosive remnants of war. According to the Landmine Monitor over 22,100 people have been killed or injured by landmines or explosive remnants of war over time in the country. The estimated extent of mine/ERW contamination as of February 2017 was just over 26.3km2, a decrease from the nearly 68.4km2 of June 2015. Contamination affects ten districts across three provinces of Sri Lanka. Sri Lanka has developed a plan for 2016-2020 aiming to make the country ‘mine-threat free’ by 2020. The Mine Ban Treaty requires the clearance of all contaminated areas, including those that do not pose an immediate threat to populations. With Sri Lanka’s accession to the Mine Ban Treaty, India, Nepal and Pakistan are the only countries in South Asia that remain outside of the Mine Ban Treaty. All three are affected by landmine contamination. The Mine Ban Treaty will enter into force for Sri Lanka on 1 June 2018. ICAN: THE INTERNATIONAL CAMPAIGN TO ABOLISH NUCLEAR WEAPONS, PSALM STUDENTS CONGRATULATE YOU! Congratulations from PSALM: STUDENTS AGAINST LANDMINES AND CLUSTER BOMBS TO ICAN: THE INTERNATIONAL CAMPAIGN TO ABOLISH NUCLEAR WEAPONS ON their Nobel Peace Prize!The International Campaign to Abolish Nuclear Weapons was honored for its work to foster a global ban on the destructive weapons according to the Norwegian Nobel Committee. The Geneva-based coalition was modeled on international efforts to ban landmines! PSALM students folded symbolic origami Peace Cranes with love and prayers for a more peaceful world for all! On November 18 and 19th, PSALM students presented their artistic installation, “THE ROAD TO OTTAWA: THE 20TH ANNIVERSARY OF THE MINE BAN TREATY”. PSALM artworks at the exhibit were inspired by the countries that “made it happen” and the continuing work to “finish the job” of a mine-free world. PSALM students acted as hosts and guides to the exhibit which depicts a visual timeline to the Ottawa Treaty. One large scale artwork included the text of the treaty in various languages. September 18, 2017 marked 20 years since the Mine Ban Treaty was adopted, when the international community agreed to end the scourge of landmines once and for all. Following the adoption, on December 3, 1997 the treaty was signed by 122 States; it entered into force on March 1, 1999. To date, 162 nations have formally joined the treaty. The exhibit has been requested to be displayed in February 2018 at the Monongalia Arts Center in Morgantown, West Virginia. On 18 September 1997, nations from around the world came together in Oslo to adopt the Mine Ban Treaty. On December 4th, 1997, the Mine Ban Treaty was signed in Ottawa. This year, we celebrate the 20th anniversary of the treaty! Banning landmines would have not been possible without great partnerships among civil society and governments. As Archbishop Desmond Tutu once said “if the Mine Ban Treaty has made a difference in the world, it is because the partnership between governments and civil society forged through the process that created the treaty has continued to this day”. 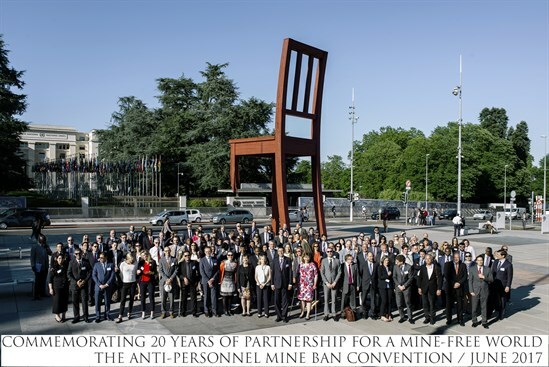 Since its inception in 1992, the ICBL— representing hundreds of NGOs, landmine survivors, mine action operators and experts — has been working closely with governments and other actors to achieve a mine-free world. The adoption of the treaty 20 years ago was a milestone start to an end of suffering caused by landmines. To date, the Mine Ban Treaty has been at the heart of many achievements. More than 80 per cent of the world’s countries outlawed landmines by joining the treaty. The stigma against landmines has grown strong. Landmine trade is virtually eliminated. Sixty-five (65) non-state armed groups have pledged not to use landmines. At least 39 states that once produced landmines have stopped producing them. Twenty-seven (27) countries finished clearing and destroying landmines. More than fifty-one (51) million stockpiled landmines have been destroyed. New landmine casualties have been dramatically reduced from the 40-55 people a day that were killed or injured in the 1990s. The rights of landmine victims have been increasingly recognized. But millions of people are still threatened by landmines and unexploded bombs worldwide and on-going conflicts in Syria, Iraq and elsewhere have created a new ‘landmine emergency’. Meanwhile development opportunities and food security in countries such as Angola, Cambodia and Zimbabwe are being undermined by millions of mines left over from conflicts that ended decades ago.States party to the Ottawa Treaty have set a deadline of 2025 to clear remaining mine contamination. After 20 years of success we have a lot to celebrate, but the work is not done. JOIN US AS WE DEDICATE OURSELVES TO THIS WORK! The Mine Ban Treaty was the first international treaty to ban a weapon of war that had been in widespread use. Thanks to pressure created by civil society the treaty did not allow for any loopholes, exceptions or reservations. The Mine Ban Treaty was highly unusual in being both a humanitarian and a disarmament treaty. It was the first international treaty to include provisions for victims of the weapon along the provisions related to the use, production, transfer and stockpiling of the weapon itself. The Ottawa Process was so successful in quickly achieving its aims that this process has been used as a model for other lifesaving movements – such as the Oslo Process to ban cluster bombs and the campaign to stop the use of child soldiers and most recently, nuclear weapons. Achievements: 80% of the world has joined the Treaty. The stigma on antipersonnel mines holds firm. Over the past 20 years since the Treaty’s adoption there has been a dramatic decrease in worldwide use, production, and transfer of antipersonnel mines, the number of casualties reported annually has been massively reduced since the campaign began; more than 51 million mines in stockpiles have been destroyed; large tracts of land have been cleared and 26 states have been declared mine-free. Crucially, any use of antipersonnel landmines is also today widely recognized as being unacceptable, and is resoundingly condemned. States Parties to the Mine Ban Treaty have embraced an aspirational deadline of 2025 to complete their treaty obligations. Based on these achievements, we know a world without landmines is possible, but the international community must remain fully committed to this goal and continue to work diligently to achieve this by 2025. Challenges: 35 states, including the United States, still remain outside of the Treaty and instances of new landmine use, though rare, are reported every year. Some 6,000 people are reported to be maimed or killed by these weapons every year. Some 60 countries and territories remain affected by landmines. Assistance and services for landmine victims are scarce and insufficient in the majority of affected countries. Therefore, there is a clear need for all states to join the Mine Ban Treaty and to work hard to fully implement it. 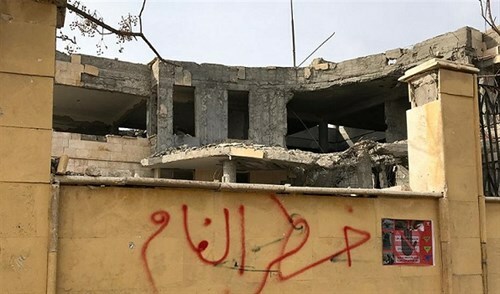 The ICBL’s global civil society movement created a legal and diplomatic precedent that placed humanitarian values above military needs and saved countless lives: we made sure this ban was focused on protecting people, rather than military needs. The ICBL is shaped by its hundreds of members in close to one hundred countries. From the beginning, the ICBL’s strength has been rooted in hundreds of civil society organizations (like PSALM) from a vast and diverse range of backgrounds being united under one goal and message: to ban landmines. Driven by the voices of survivors, the ICBL used its technical, legal and political expertise to play a major role in drafting the Mine Ban Treaty from the start of the Ottawa Process that led to adoption of the MBT. The ICBL, along with the ICRC were considered vital partners in the process and included in all the diplomatic meetings leading up to the Treaty negotiations, and during negotiations themselves. The critical importance of the presence and input of the ICBL and the ICRC was specifically recognized in the preamble of the Treaty. The role played by the ICBL in the Ottawa Process was recognized by the Nobel Committee in December 1997 which granted ICBL and its Coordinator the Nobel Peace Prize for changing ‘a ban on antipersonnel mines from a vision to a feasible reality’ (quote from the Nobel Committee). After the treaty’s entry into force, the ICBL established an unprecedented independent civil society-based systematic monitoring and reporting regime on universalization and implementation of the treaty – the Landmine Monitor, which has been issued every year since 1999. The ICBL has spent 25 years campaigning for a mine-free world and has seen how far the world has come towards reaching this goal.